A charcoal built in BBQ with oven. The barbecue is the focal point of summer entertaining and this year sun soaked stylish gardens across the UK will be searching for Bar-Be-Quick’s Built-In Grill & Bake Barbecue, the essential accessory for the stylish garden. The Bar-Be-Quick Grill & Bake is a permanent fixture that fits into any garden design and offers something more than the standard barbecue, providing a baking compartment below the firetray where food can be baked or simply kept warm to ensure all your guests can eat piping hot food at the same time. PLEASE NOTE - The grill type may differ from picture shown. 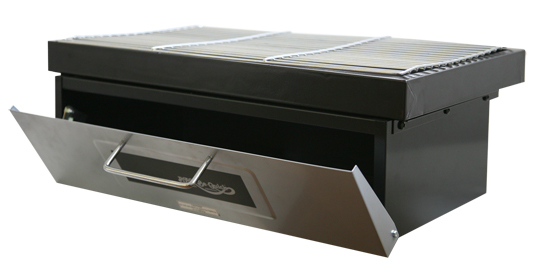 The brick Build In Grill & Bake charcoal barbecue provides a large cooking area (62 x 36cm) and three adjustable grill cooking heights – essential for cooking different meats. It has a removable firetray for easy cleaning and the item is finished in a heavy duty vitreous enamel. Building the BBQgrill in your garden is easy using the full instructions included to ensure a perfect centre piece to your garden. Just bought this had great fun building the brick base - never done any bricklaying before was easy to do anyone could do it!! - just watch the video - Its oven works great too - Top marks from me.... its BBQ time!! 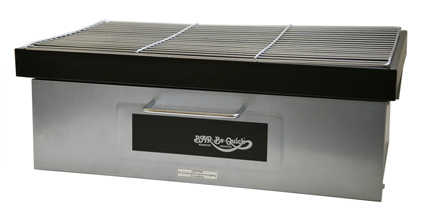 I am writing to thank you for your very prompt response to my recent order for a Build in Grill n Bake barbecue.I bought this to replace one I purchased about ten years ago, which has given me excellent service and is still in use. I had tried to buy a replacement from local retailers, having bought the original from Homebase in Wellingborough but was unsuccessful. I was delighted, therefore, to find your website and to be able to place an order for another one. They might want to rethink the design, because the oven part is now rendered useless because of a cheap flimsy hinge. The BBQ itself is good. Bought this BBQ and it's great apart from the hinge for the oven door, which buckled on the first time of use, and now will not shut properly.